Our stories offer hope. Especially when the Author of our story is faithful. Stories have a way of inspiring us. We identify with the protagonist of stories and want to see things end well. Our stories offer hope. Especially when the Author of our story is faithful. Stories are powerfully used to involve spectators and to begin the process of shifting mindsets from despair to hope. The God of this universe used stories/parables to inspire His followers, too. 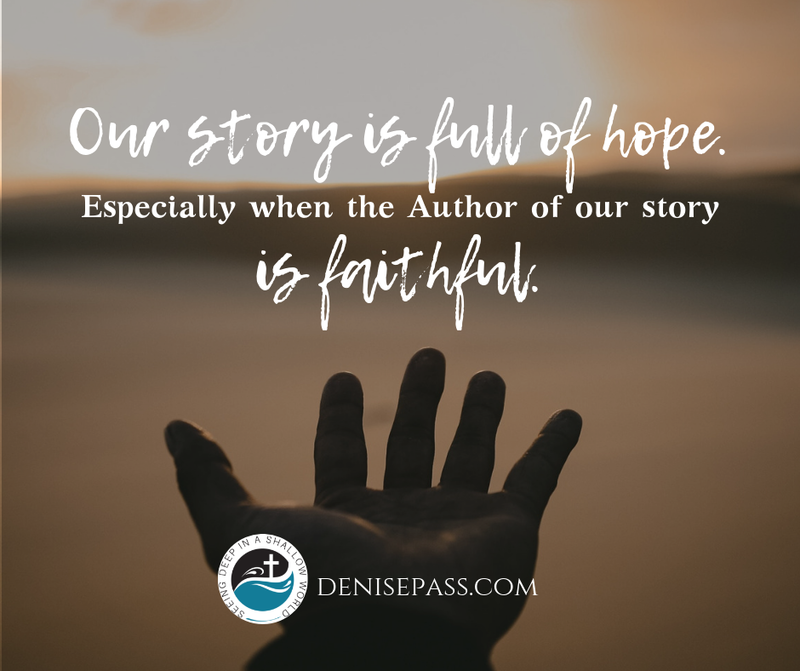 The story Jesus used to teach His disciples to never give up praying and hoping is of the widow and her persistent asking a judge for what she hoped for. This is such a beautiful parallel of how we can approach the God of this universe and share our heartfelt needs. God sees. God hears. And God will act on our behalf. Our relationship with God is a simple storyline with a promise: God will answer His people. Quickly. Our God is sovereign. He knows what we need and when we need it. God’s promises never fail. And His timing is perfect. The development of character, trust and patience while we wait are a part of the fruit of hoping. And it is in asking and waiting that we see God’s promises fulfilled. Our hope does not come from the promises of man or the desires of our heart, but from the promises of God found in His word. God will answer. Will we seek? When we read the Bible consistently, our minds are enveloped by the stories of our faithful God as He related to His unfaithful people. Our faith is stirred by how God interacts with His people. He has parted seas, delivered His people and answered His people time and again. From a simple peasant to a wealthy King, God hears and sees us all. And He will again. How has God intervened in your story? What hopes have you seen fulfilled thus far? You and I are a part of His story. Whether our hopes are realized on this side of eternity or on the other side, having hope in the character of God helps us to live lives focused on God rather than on worshiping our hopes.